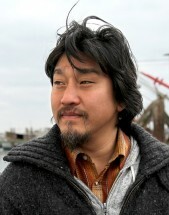 One part Southern soul, one part Asian spice, and one part New York attitude, Chef Edward Lee is a Korean-American who grew up in Brooklyn, trained in NYC kitchens, and has spent the better part of a decade honing his vision at 610 Magnolia restaurant in Louisville, KY.
Lee’s adventure to Southern-cuisine eminence began in 2001 on a road trip to Louisville during the Kentucky Derby. He discovered a local gem of a restaurant called 610 Magnolia and spent the evenings cooking in the kitchen. He fell in love with his surroundings and within a year, he moved his life from NYC to Louisville, and into the dialogue of the blossoming New Southern food scene that would take shape around a handful of young and forward thinking chefs. Lee’s culinary style draws inspiration from his Asian heritage, his New York training, and his embrace of the American South, coupled with the best ingredients from local farms. Lee’s innovative cuisine has twice earned him a finalist nomination for the James Beard Foundation Awards Best Chef: Southeast in 2011, 2012, 2013 and 2014. He has been featured in Esquire, Bon Appétit, GQ, Gourmet among many other publications; won on Food Network’s “Iron Chef America,” was a favorite on “Top Chef: Texas, Season 9”; and has appeared on shows ranging from Cooking Channel’s “Foodography,” Andrew Zimmern’s “Bizarre Foods America” to CBS’s “The Talk.” He will be the featured chef in Season 3 of THE MIND OF A CHEF to air on PBS in fall, 2014. Lee’s career extends to writing credits as well, with articles published in Gastronomica, Esquire, Organic Gardening and many other journals. Lee’s self-authored cookbook, Smoke & Pickles, (Artisan Books, May 2013) chronicles his unconventional journey from the kitchens of Brooklyn to becoming a lauded Southern chef. In addition to 610 Magnolia, Lee operates a special events dining room called The Wine Studio, which features cooking classes, wine tastings and guest chef dinners. MilkWood is Chef Lee’s newest venture. Located in the basement of the locally revered Actor’s Theater in downtown Louisville, MilkWood interprets the traditions of Southern comfort food with an Asian pantry. The menu features small plates and smoked meats, all personalized and creative versions of familiar classics in addition to an array of bourbon cocktails. When he is not in his kitchen, Lee spends the rest of his time on his numerous collaborations. His signature blend with Jefferson’s Reserve called Chef’s Collaboration Blend is a luxury small batch bourbon he developed with Master Blender Trey Zoeller. He is also working with a Korean company to launch an organic fermented Korean hot sauce in spring of 2015. Lee approaches his professional and culinary life with candor, humor, and—most importantly—the same spirit of adventure that was the original impetus for his success.